To train employees to work in his 22,000 funeral homes, Waltrip founded one of the top mortician schools in the country, also based in Houston. At the museum, Keeny says people don’t know that Houston dominates the funeral industry because we don’t like to talk about death. Farrah Akhtar says there’s no such thing as getting a quick sari. “No, no, no, you want to try everything on, then you need the jewelry the shoes, and then you want to bargain and then you might not be happy with the deal, so you’ll go somewhere else,” Akhtar says. Akhtar is a community manager for Yelp, and a sari store insider. Our first stop is Poshak, off of Interstate 69. Owner Anas Ahmed gives us the grand tour. There’s a few ways to buy a sari here: ready-to-wear, or you could pick out some vibrantly colored cloth and have it sent to their in-house tailor, or – if you have a couple hundred dollars burning a hole in your pocket – they’ll design one for you from scratch. Poshak’s designer Sameera Faridi will travel to Pakistan to hand-deliver your order, where it will be hand died, sewn and beaded. Three months later, she’ll get back on a plane to pick it up. Ahmed says business has really picked up since the store opened eight years ago. He says their clientele is as diverse as Houston. 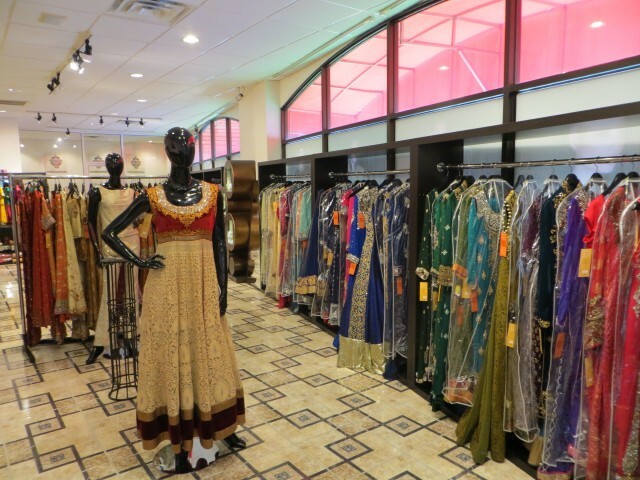 Poshak’s boutiquey specialization contrasts with Houston’s sari warehouses, which boast huge selections of ready-to-wear saris. Roop Sari Palace is about the size of a Texas supermarket. “This is all their stuff, massive, you could spend hours in here,” Akhtar says. On a weekday lunch, about 40 women browse through the racks. This part of town was designated the Mahatma Gandhi District in 2010, and is known for its South Asian restaurants and sari shops. Ahmed says a lot of his customers buy outfits in Houston and then wear them in Pakistan. Although Ahktar has never been to Pakistan, she says she loves a good sari. “This is the traditional sari the three piece style that I love, I just think it’s so elegant,” Akhtar says while examining a bright blue and pink style. She’s found a few saris that she likes here, but she’s not buying; sometimes the hardest part of buying a sari is finding the perfect event to match. Imagine waking up in your luxury apartment. There’s a knock at the door – in wheels some scrambled eggs, bacon, toast, a gourmet breakfast delivered. Every morning. And your company’s paying for all of it. That could be the reality for some Houston transplants — as early as June. If David Redfern has his way. He’s the president of Waterwalk. 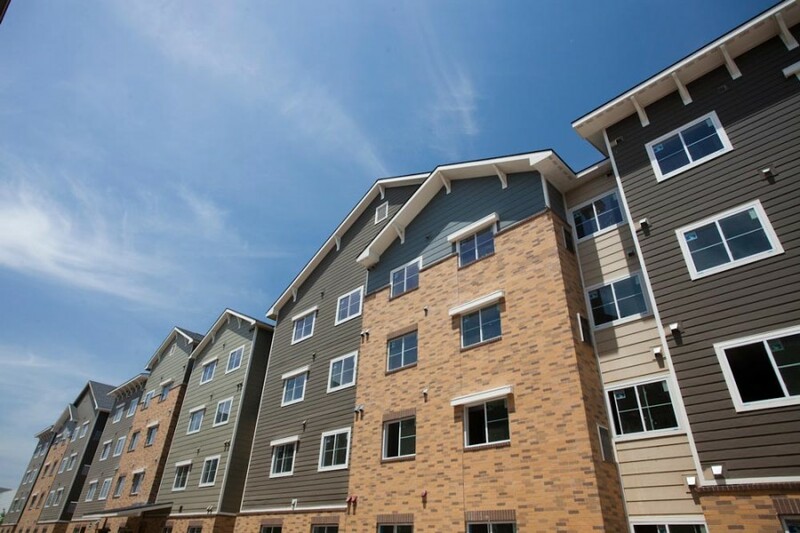 “Waterwalk specifically is one part apartment, one part corporate housing and one part upscale extended stay hotel,” Redfern says. While anyone who can afford the base rent of $2,ooo a month is welcome, Redfern has one specific customer in mind. “Our customer is the people that are traveling for those types of business trips and so that tends to be companies that have relocations, trainings and projects,” Redfern says. Houston added more than 100,000 jobs in the last 12 months and hosted more than 4 million business travelers. Forty-one percent of those jobs were in the energy and healthcare fields. Relocation specialist and writer Michelle Sandlin says all those business travelers need a place to stay. “Houston has a lot of temporary housing providers offering various products and there’s always been, for the last few years, an inventory shortage in that regard,” Sandlin says. More than 5,000 energy-related firms in Houston compete for some of the best talent in the country. And when you’re trying to woo someone to your team, every little luxury counts. “We deliver breakfast to each room, each apartment, we provide obviously housekeeping, we have a car service that will take people wherever they need to go,” Redfern says. Once the Houston property is up and running, Waterwalk plans on expanding to Austin, San Antonio and Dallas/Fort Worth. “Well, Houston has had and Texas has had a steady influx of people moving here for several years, we’ve got population growth that continues to surge,” Sandlin says. William Miller is using his studio in the Heights for some decidedly uncreative things. His health insurance runs out next month, and he has to figure out a way to make things work. He’s HIV positive and borderline diabetic, which puts him in a high risk pool. This is the first time he’s without a safety net. He got laid off from his job as a graphic designer last year and now he pursues his art full time. 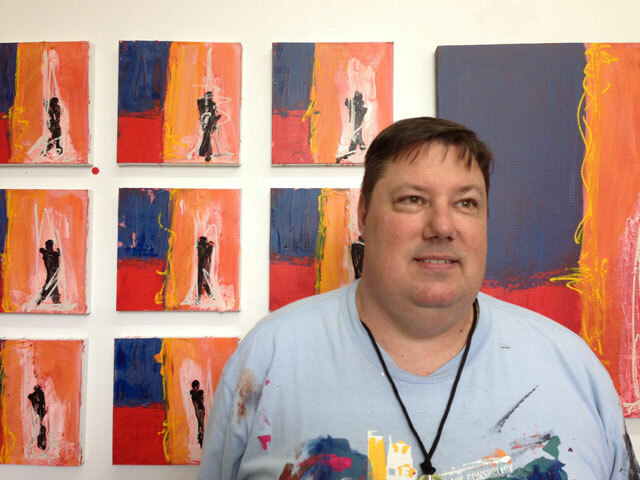 He estimates he’d have to sell 9 paintings a month to pay for the level of care he has now. He’s thinking about getting a part-time job at Starbucks just for the benefits. But that would take him away from his studio, so he’s looking for other options. He found Legacy, a community clinic in Montrose that’s willing to treat him. They’re helping him apply for federal coverage under a grant for HIV positive patients. If that doesn’t work out, they have a sliding scale fee structure for their uninsured clients. Kimberley Paulus is with Legacy. She says their Montrose clinic serves many people in Houston’s entertainment industry. Legacy has been operating in Houston for 30 years, it played a key local role in the 80’s AIDS crisis. Now they’re a federally qualified health center. They provide preventative care, dental, pediatric — the works. They say they’re trying to combat the sick, starving artist stereotype. Legacy says the situation has gotten a bit better since The Affordable Care Act started kicking in. Young people can stay on their parent’s insurance until they’re 26 and it’s easier to get coverage from a spouse. But for artists like Miller who don’t fall under those categories, it’s tough. Freelancers in other cities have organized to buy health insurance as a group, but that’s yet to happen in Houston. For the meantime, the people behind Houston’s vibrant arts community are finding their own ways to get healthcare, even if that means staying uninsured. There are currently 12 museums on the National Mall and one more under construction. The National Museum of African American History and Culture is scheduled to open in 2015. A group of activists is now urging the Smithsonian to build another ethnic museum, this one to celebrate Latino contributions to the U.S. The idea for a National Latino museum was borne in 1990 when a task force reported the Smithsonian was largely ignoring Latinos in its exhibits. At the time, out of the 470 “notable Americans” in the National Portrait Gallery, only 2 were Latino. Since then, the Smithsonian designated an internal office devoted to including Latino stories within the existing framework. But The Friends of The American Latino Museum say that’s not enough. Estuardo Rodriguez represents the group. Congress is currently reviewing a bill to designate a vacant Smithsonian building as the future home of the American Latino Museum. Critics of the project say the Smithsonian should stop building specialty museums and should instead concentrate on improving the ones it already has. 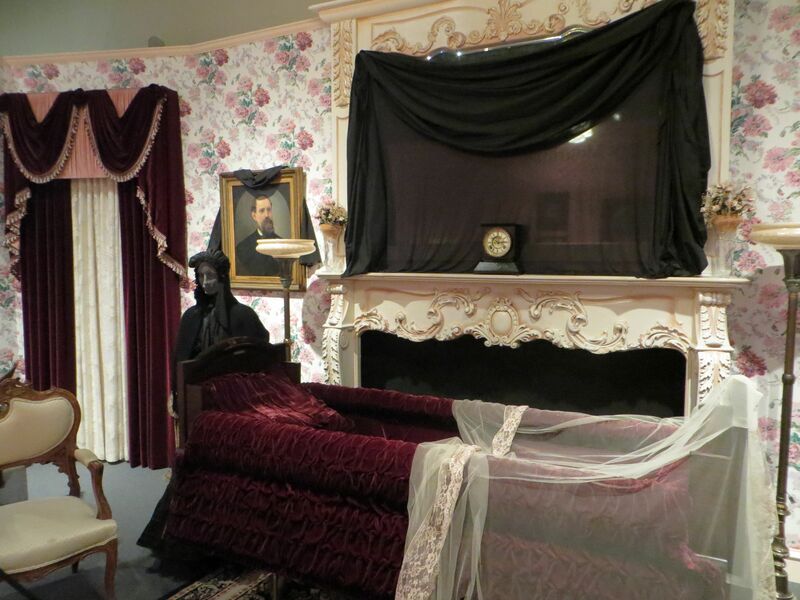 New museums are expensive, and some argue that ethnic museums promote cultural isolationism. 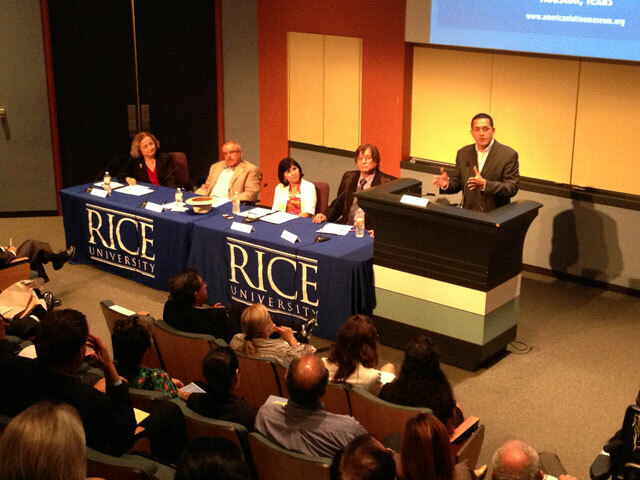 Maggie Rivas-Rodriguez is a journalism professor at the University of Texas Austin. She says the American Latino Museum isn’t about segregation, it’s about education. Rivas-Rodriguez hopes the museum’s creation will prompt the inclusion Latino-American History in schools all over the country, which she says is sorely lacking. She wants the museum to be a national meeting place, and a symbol of the experiences of the more than 50 million Latinos living in the U.S.